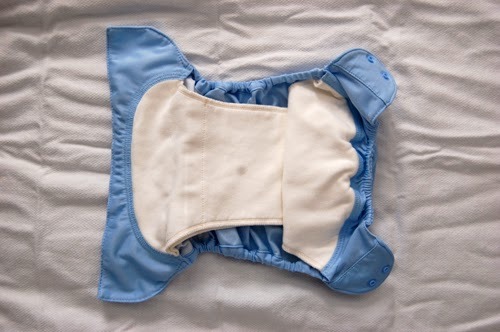 Before our daughter was born, we considered using cloth diapers instead of disposables. I did not know much about cloth diapering at the time, but I was inspired by this post at Young House Love. There is a ton of information out there on the different types of diapers, and there are even classes one could attend to learn about the different options. I found this 7-part video useful in figuring out what types of cloth diapers would best suit our family. 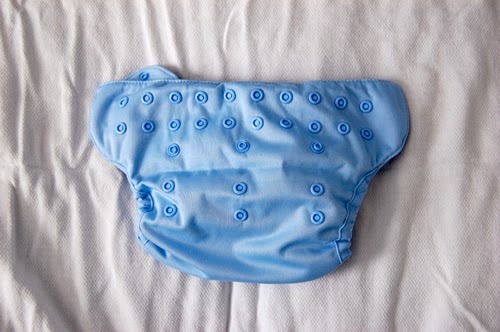 Also, Amanda at Poppies and Ice-cream has a good overview of the cloth diaper options and some of the reasons for using them. This all sounded great to us, but we knew that these diapers, despite being one-size (the size is adjustable, as I will explain later), are too large for babies under 10-12 pounds. Since our daughter was a small 6-pounder, we knew we would have to figure out an alternative diapering solution until she grew enough to fit into the Elementals. We decided to start with disposable diapers and switch to cloth diapers when she was ready. Well, I have to say, it was easy to get used to disposable diapers. So convenient to simply toss the soiled diaper, along with the disposable wipes, into the diaper pail and forget about it (at least, until the diaper pail starts smelling up the room)! But we ran into a problem. Our daughter developed a nasty diaper rash with every kind of disposable diaper and wipe that we tried, and we had to constantly battle this rash for three months. It was painful to see her red, raw bum every time I changed her diaper. We had to use a diaper rash cream at every diaper change, and even that helped only infrequently. I suspected that her skin was sensitive to some chemicals, either in the diapers or the wipes (which are soaked in alcohol), or both. We brought this up to our pediatrician early on and asked if there would be any benefit to switching to cloth diapers in order to stop this rash. Our doctor told us that usually babies get a WORSE diaper rash with cloth diapers because they are less absorbent than disposables. This made us wary of switching to cloth diapers, but after three months of almost constant diaper rash, we didn't have much to lose (except a few hundred bucks, I guess). We took the plunge and purchased our Elementals. And wouldn't you know it, our daughter's diaper rash disappeared within days! We have been cloth diapering for three months now, and she only has an occasional, mild diaper rash that quickly goes away (usually on its own). I wish we would have switched to cloth diapers sooner. Here is what we bought to get us started on cloth diapers. 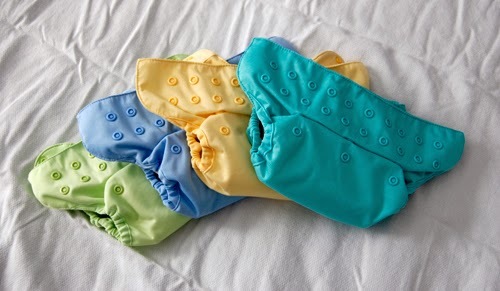 We ordered sixteen bumGenius Elemental diapers in four colors (four of each): grasshopper (green), butternut (yellow), light blue (twilight), and light turquoise (mirror). A couple of months later, we bought four more diapers because sixteen was not enough to get us through two days between laundry cycles. We also bought cloth wipes (mostly Grovia, but also a few of the more expensive Thirsties), for a total of 30 count. We keep them in two Huggies wipe boxes that we already had from our disposables days. Unlike the disposable wipes, the cloth wipes are dry. But wipes are more effective at their job if they are moistened. We chose not to use any special wipe solution (plenty are marketed out there for this purpose), and simply use water. We keep a small spray bottle filled with water near the changing table, and spray the wipes as necessary before use. We find that using cloth wipes is easy and convenient, since they go in the laundry together with the diapers and don't require and additional maintenance. For storage of dirty diapers and wipes, we bought two Planet Wise wetbags in size large (one in Owl, and one in April Flowers). I know some people throw these in the laundry together with the diapers, but we wash them with the baby clothes load instead. We do this because the diapers go through a hot wash, and these bags are not designed to withstand repeated cycles of hot temperature (the lining that keeps the odors in can degrade over time). So we wash them on a cold cycle with other baby stuff. After pre-washing the diapers according to instructions, the first thing we had to figure out was the sizing. 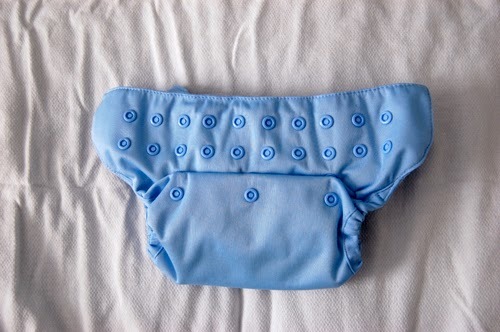 AIO means that the diaper has snaps that adjust to three different size settings: small, medium, and large. In theory, the small setting should fit babies 8-16 pounds, the medium is for 17-22 pounds, and the large is for 23-35 pounds. However, keep in mind, that these diapers are really too big for an 8-pound baby, and don't really fit well until 10-12 pounds because they are too bulky on smaller babies. Also, as the bumGenius FAQs mention, babies frequently change shape as they grow, so you may find yourself using a larger setting on a younger baby, or a smaller setting on an older one. When we started cloth diapering, our baby was about 11 pounds, and the small setting was too small for her. At 6 months, she is 14.5 pounds, and we have been using the medium setting almost the entire time so far (with an occasional need to use the large setting). In addition to the three rows of snaps that adjust the size of the diaper, there are two rows of ten snaps that adjust its circumference in order to accommodate the varying shapes and sizes of babies. The nice thing about having two rows is that each row can be adjusted individually. For example, our baby has a smaller waist but chunky thighs, so we adjust the top row tighter than the bottom row (which makes the opening for the legs wider). After figuring out the size, we had to deal with the absorbent cotton insert. At the largest size setting, the insert is fully unfolded, but at the other two size settings, it needs to be folded in some way. 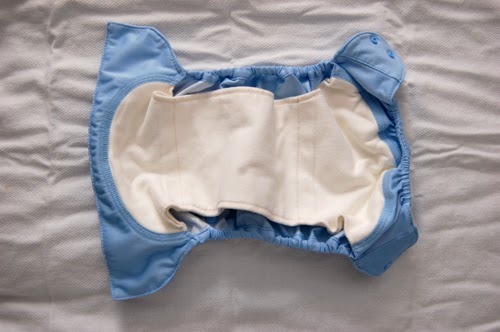 We take the extra fabric and fold it approximately in the middle, and then fold down toward the back of the diaper (which is on the right-hand size of this photo). We also tried folding it another way, but found that it created too much bulk in the back for a baby who spends much of her time lying on her back. 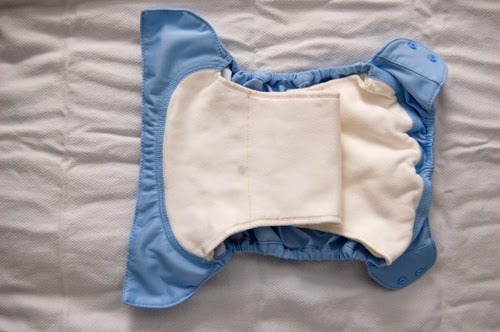 In this alternative folding method, the extra fabric is tucked in under a fold toward the back of the diaper. I should mention that all this folding is necessary because the insert is not removable, as it is sewn into the leak-proof cover. 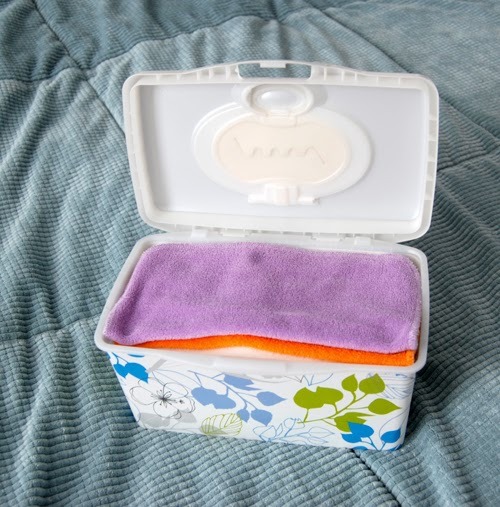 We store our cloth diapers near the changing pad in a pretty box that I bought at Michaels. We used to use the same box for storing our disposables. Our changing pad and all diaper supplies are actually on top of a dresser that we use to store baby clothes (which makes diaper and clothes changes very convenient), so any extra clean diapers are stored in one of the dresser drawers (I can fit approximately 8 cloth diapers into the box). The dirty diapers are stored in a wetbag, which we used to hang on a hook off the side of the dresser. However, we found that opening and closing the bag released the odors into the room, and the odors lingered long enough to bother us, so we moved the wetbag out of the room. For now, it hangs on the handle of the bathroom door until we figure out something more permanent. The dirty wipes and wet diapers go directly into the wetbag. Before throwing the soiled diapers in there as well, we spray off the poop into the toilet using a diaper sprayer that we installed into the plumbing of our toilet. Spraying the poop off the diaper helps minimize (if not eliminate) poop stains on the cotton insert. By the way, poop stains are just a reality of life when it comes to cloth diapers. If a clean diaper comes out of the wash stained, you can be sure that it is clean and sanitized. The stains can be easily removed by drying the diapers in the sun (the sun does an excellent job of bleaching the diapers), or by adding bleach to the wash cycle once a month. One other thing I want to mention about using the cloth diapers is related to the diaper rash. On the few occasions that we've had to use a diaper rash cream with cloth diapers, we used the California Baby diaper rash cream because it is safe for cloth diapers. Most diaper rash creams contain petroleum jelly, which covers the cloth diaper insert in a layer of petroleum that causes the diaper to repel liquid instead of absorb it. Laundering the Elementals is a long process. The diapers are supposed to go through a soak cycle, a hot wash, and a rinse cycle. Because we have a front-load high efficiency washer, there is no soak cycle, so our first step is a full cold-water cycle with one scoop of detergent. We use Eco Sprout detergent (I like the smell of the Green Tea version), and we are quite happy with it so far. For the next step, the hot wash, we use two scoops of detergent. Along with the rinse cycle, it takes about 3.5 hours to wash the diapers. We then put the diapers in the dryer for 60 minutes on medium heat. Sometimes, that is enough to thoroughly dry the diapers, but sometimes we have to run the dryer for another 20 minutes. This definitely helps decrease the drying time. We also tried adding wool dryer balls to the dryer, as they are supposed to reduce drying time and reduce static. However, they were not reducing static or drying time, and instead were leaving wool strings all over the diapers and wipes, so we stopped using them. So far, we've done only day trips with cloth diapers, taking enough diapers with us to last the day. We usually put the dirty diaper into a ziploc bag while we are out and about. Someday, we might purchase a smaller wetbag for that purpose. For the one week-long trip that we've done with the baby so far, we were not brave enough to take the cloth diapers with us. We used disposables instead, and of course the diaper rash came back almost right away. In the future, I think we will take cloth diapers with us if we travel somewhere where we can easily do laundry (for example, when visiting my parents). ARE WE HAPPY WITH CLOTH DIAPERS? Overall, we are really happy that we switched to cloth diapers. Not only does our baby no longer have a diaper rash, but we are also saving money in the long run, and we feel good about not contributing tons of plastic waste to the landfills. Yes, cloth diapering requires a bit more work than disposables (and certainly more laundry), but for us it is the right choice, and we plan to continue cloth diapering until our daughter is potty-trained.